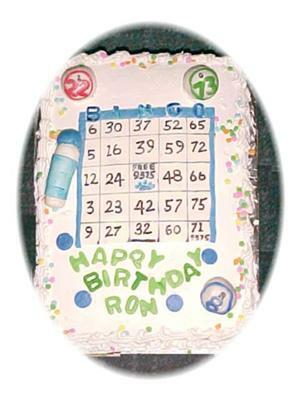 For this bingo birthday cake, I made a 9 x 13 confetti cake and used buttercream frosting. I made the balls and dauber and bingo card out of fondant. I used a 30 tip for the shell border and sprinkled the little colored confetti on top around the shell border. All is edible.